Mix all ingredients into a chilled bowl, dust individual glasses with freshly grated nutmeg. It’s official! Ballots have been counted, polling places are closed, and chads are not hanging. Last week I challenged all of my readers to come up with the best rum punch they could, with the idea of serving that rum punch at a Labor Day party. At stake were bottles of Mount Gay Eclipse, Mount Gay Eclipse Silver, and Mount Gay Extra Old rums (generously donated by Mount Gay Rum) and a bottle of RumDood Falernum #2. All the contestants had to do was submit a punch recipe with a rum base (i.e. using rum as the primary spirit) and I would make and taste them and declare a winner. When I started the contest I figured I’d get 10-12 entries. When I stopped accepting submissions at midnight of August 29th, I had 24 rum punch recipes in comments on the contest post and in my inbox. My “simple” rum punch contest saw me driving to store after store as I collected the necessary ingredients. A number of the ingredients were completely foreign to me. I had punches calling for goods I could only buy in Korean stores, punches with teas I’d never heard of, punches with Strega, punches with sorrel syrup (which is made with a flower that is similar to hibiscus – NOT with actual sorrel), and even punches with Tang. I bought citrus by the truckload, a watermelon or two, and I may or may not have had to make grenadine, honey syrup, ginger syrup, sorrel syrup, and cinnamon syrup. After the first evening of making syrups and juicing fruits and making punches, my kitchen was a little worse for the wear. In the end there were a few stand-out punches and I had a really hard time coming to a decision on who should win. But, being the dedicated drinker blogger that I am, I persevered in the only way I know how: by pawning off the task on others. I made two bowls of punch, one each of the top two punches on my scoring sheet, and took them to a party and let the guests sort it out for me. 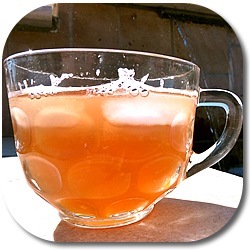 The victor: Captain Parker’s Punch. This is the drink where England meets the Caribbean! The essence of a London Sour provides a subtle backdrop to the excellent island flavor of the Mount Gay Rum punch. Like sailing in a pirate ship through a tropical storm with supermodels and rock stars. The punch is a wonderful creation. The opening is quite standard rum punch, but is followed by the peaty smoke flavors of the Scotch (I used Highland Park 12 Year Old). It’s refreshing and just flat-out different. A very cool take on a classic drink style. Congratulations to Zack and thank you to all who participated! a very proud moment for me! Good job, Zack. The description is apt. Well balanced, with two distinct flavors blending but neither losing its presence. Let’s just say the punchbowl was quickly emptied. Damn but that does look good. Wait a minute… that’s how your kitchen looked last time I was over and we weren’t making punches! The picture doesn’t do justice to the degree to which my kitchen was destroyed. As Nik can attest, every flat space in my kitchen – including the open dishwasher door – was covered with cutting boards, jars, bottles, fruit, peels, slices, syrups, and sugars. Could you post their recipes, too? I would love to try them all out. Have no fear, Adam. There will be a post detailing some of the runners-up coming later this week! What sort of Scotch went into this? I feel like it probably wasn’t Ardbeg. I used Highland Park 12 Year Old Scotch for this punch. Next post: Thursday Drink Night’s First Anniversary: Tiki Night! Previous post: Labor Day Rum Punch Giveaway!